Over Christmas week of 1990 Channel 4 showed a short series of Hong Kong movies, introducing a mainstream UK audience to a type of film which very few of them would have been familiar with. One of those movies was Mr Vampire, which has justifiably come to epitomises a whole sub-genre of Hong Kong movies: the hopping vampire movie! If you’ve never seen one of these films – and you should, you really, really should –this is a great place to start. This disc, from specialist label Hong Kong Legends, is a fine addition to their catalogue of mainly Jackie Chan / Bruce Lee-type movies. The 1.78:1 anamorphic transfer is colourful, detailed and generally free from blemishes. Minor graininess and film hops on edits (a characteristic feature of many Hong Kong movies) are a little distracting, however. The disc presents the original Cantonese version and a lame English dubbed version, both in primitive but entirely serviceable 5.1 mixes (at 448kbps). The film's Cantonese mix can be accompanied by optional English subtitles, which were obviously written by someone with a good grasp of English (not something you can generally take for granted if you source discs from outside territories where English is the primary language!) 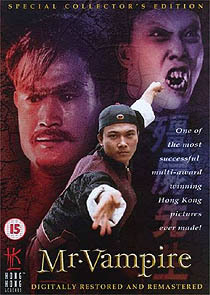 An exemplary commentary track by Hong Kong movie expert Bey Logan is the main extra for uninitiated viewers, explaining the unique mythology of Hong Kong vampires, as well as providing extensive background information about the film and the island's thriving film industry. Other extras include A Tribute to Lam Ching-Ying (10m), a pair of trailers and interviews with two of the leading cast members (totaling about an hour). Trailers for two other Hong Kong Legends titles are also included.